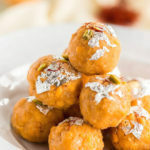 Ladoo is an Indian sweet, can be made using various ingredients and is round in shape. 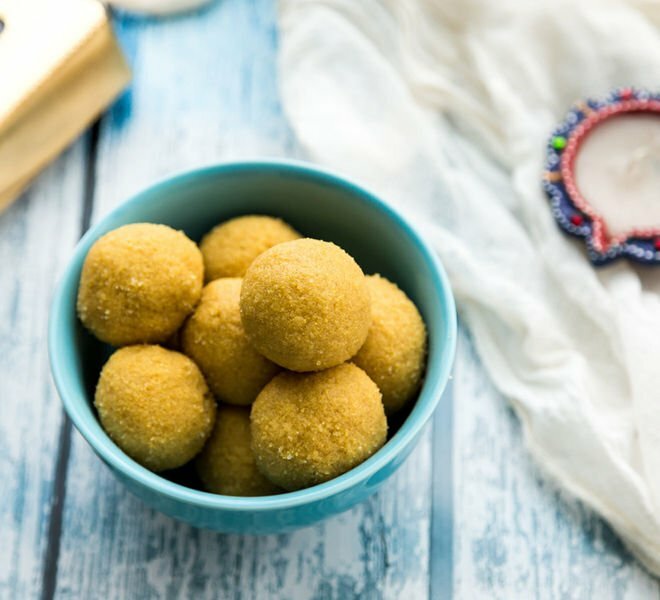 Seriously we make ladoos out of so many ingredients, there’s motichoor ladoo, aata ladoo, coconut ladoo, semolina ladoo, this ladoo that ladoo and this list is endless. Out of all these amazing ladoos, besan ladoo is my absolute favorite. It is made using chickpea flour which is called besan in Hindi. So yeah, stay away for this if you are allergic to nuts. I LOVE it a lot. In fact back home during Diwali, I would always scan through the sweet boxes to see if any one of them had besan ladoo in them. Even though one can get these ladoos at almost every sweet shop in India, they don’t always taste good. At least that’s what my personal experience is. 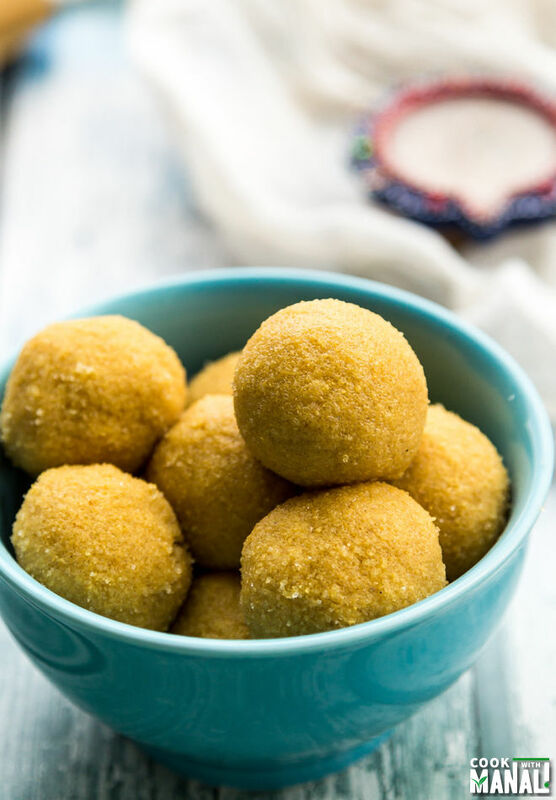 What I don’t like about store bought besan ladoos is the addition of semolina (sooji/rava). 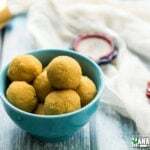 It is so commonly added in besan ladoos to give them a crunchy texture but somehow I can only love the plain ladoos, made only out of besan. And the besan ladoos that I loved most was that my nani (maternal grandmother) used to make. They were simply the best. Wishing everyone a very Happy Diwali. May the festival of light fill your home and hearts with love and happiness! 1. Put the ghee in a pan and add besan to it. 2. Roast the besan on low-medium flame for 10-12 minutes till it starts giving a sweet aroma. The color of the besan will also change to light golden brown. 3. Once the besan is roasted, switch off the flame and allow is cool down a bit, around 5-7 minutes. 4. In the meanwhile, using a blender powder the sugar with cardamom powder. Set aside. 5. After 5-7 minutes, the besan would cool down a bit, remember you still want it to be warm but it shouldn’t be hot. If you add sugar while the besan is still hot, the sugar will melt and the mixture will become runny and you won’t be able to make ladoos out of it. 6. Once it’s warm and you can hold the besan mixture in your hands, add the sugar and 2 tbsp of melted ghee into it and mix. 7. 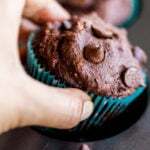 Take a small amount of the mixture in your palm and press with your fingers to make a small round ball. 8. Use the entire mixture to form ladoos while the mixture is still warm. You should be able to get 12 small besan ladoos out of this. Indian sweet made with chickpea flour, sugar, cardamom and ghee (clarified butter). Put 1/3 cup of ghee in a pan and add besan to it. Roast the besan on low-medium flame for 10-12 minutes till it starts giving a sweet aroma. The color of the besan will also change to light golden brown. Once the besan is roasted, switch off the flame and allow is cool down a bit, around 5-7 minutes. In the meanwhile, using a blend powder the sugar with cardamom powder. Set aside. After 5-7 minutes, the besan would cool down a bit, remember you still want it to be warm but it shouldn't be hot. Once it's warm and you can hold the besan mixture in your hands, add the sugar and 2 tbsp of melted ghee into it and mix. Take a small amount of the mixture in your palm and press with your fingers to make a small round ball. Use the entire mixture to form ladoos while the mixture is still warm. 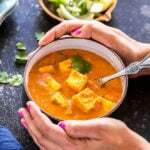 * The 2 tbsp of ghee that I used in the end is optional. 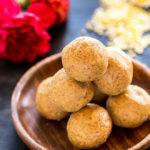 You can avoid it if you want, I was able to make ladoos even without adding the 2tbsp of ghee but the ladoos bind better, taste better and look smoother with that extra ghee. So I would say go for it. 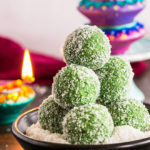 * If you like use nuts like cashews, pistachios to garnish the ladoos. You can even mix chopped cashews into the ladoo mixture while shaping them. 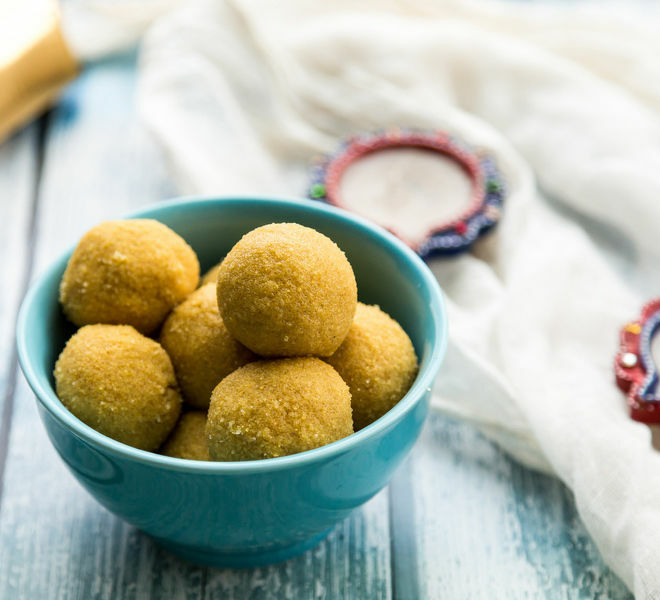 * Use semolina (rava/sooji) to bring an extra crunch into your besan ladoos. Never heard of besan ladoo before. You definitely have got me curious to know what these taste like.. they do look delicious though! Thanks Thalia, they are very delicious! Thankyou for all your wonderful recipes. I have already tagged alot of them in the “Try these soon” list! 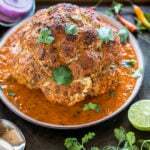 I have a question regarding this recipe. 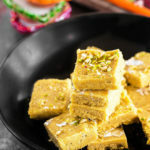 Do I need to change anything to make besan barfi instead of ladoos? Tried ur besan ladoo recipe today!! They tasted awesome!! 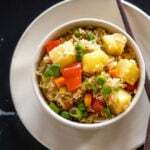 Thank you so much for such an easy recipe! Mine didn’t turned out to make circle. As it was spreading. Rather than that taste was gud! Sorry to hear that Aiman. Whenever you can’t bind ladoos, just trying adding more ghee. It will bind. By sugar, powdered do you mean white sugar or powdered sugar? When making the balls at the end I had to put a lot more melted butter in it to make them stick, but they still don’t. They’re really crumbly and won’t seem to stick. Maybe it’s becasue I used the wrong sugar? When roasting the besan should I be stirring it? My butter turns chunky when roasting and I don’t know if it’s supposed to do that.